The Affri Shore D (3002) Portable Hardness Tester / Durometer measures hardness using a point or a ball, that penetrates the material under spring pressure, with variable force depending on the model. 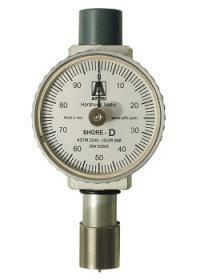 A direct reading is displayed on the dial which is graduated from 0 to 100 Shore Hardness Units. For rubber, plastics, medical components, paper, sponge using Shore A, B, C, D, O, OO, E, M, 000, 000-S scales. With slim nose to ensure exact measurement also on small components. With tungsten tip which outlasts hardened steel up to ten times. 3001 A For soft, flexible rubber, plastic, PVC, polyester, neoprene, leather, Thiokol, nitril rubbers, tyres, etc.